Happy Chinese New Year! For people who don’t know, it was on January 31st this year. I’m filling another request here. 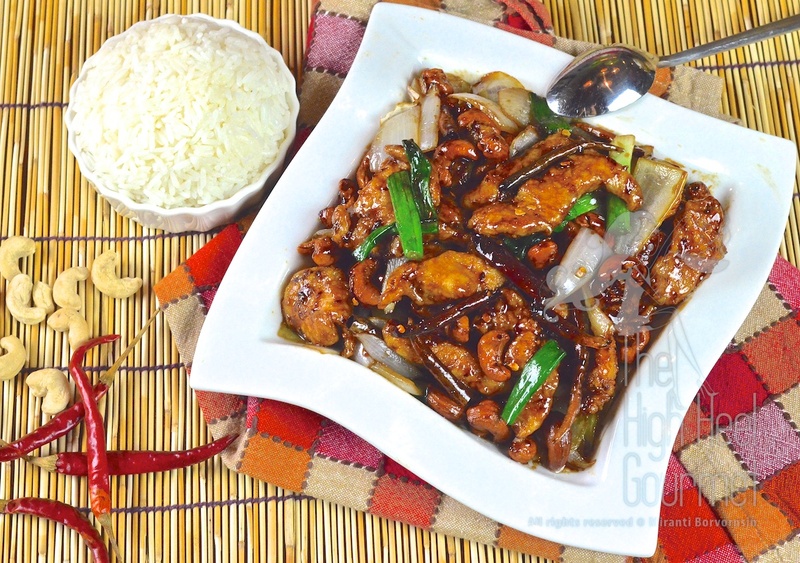 Chicken with cashew nuts is one of my all-time favorites, as it is for my husband. It’s a simple dish that’s become a staple for the Thais and the farangs both. The ingredients are easy to find all over the world. When I was traveling a lot and staying at people’s homes instead of hotels, I considered this to be a very simple dish that I could make for my hosts. This is NOT an original Thai dish. 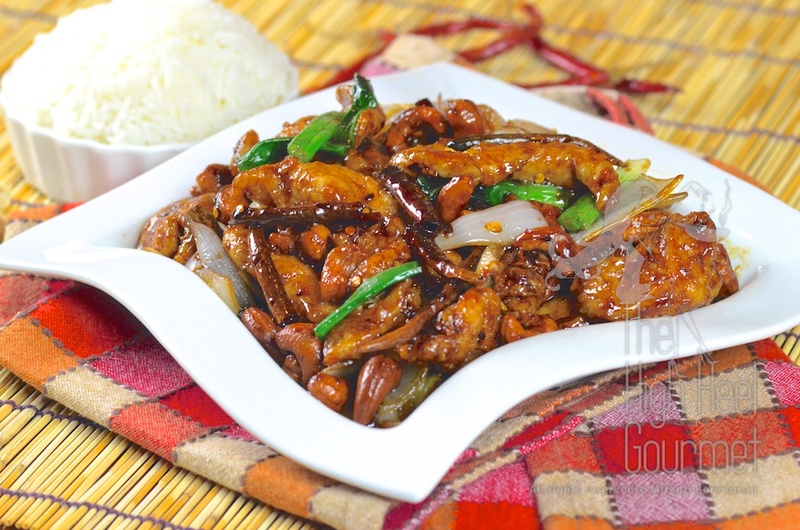 It’s from the Sichuan Chinese dish called “Kung Pao Chicken”! Does that sound familiar? The Thai just changed the nuts from peanuts to cashew nuts. I don’t have the clear history of the dish. When did it migrate to Thailand? How did it divorce the peanut and marry the cashew? I just know that the Gai Pad Med is now a well respected immigrant that already has a Thai name and lost the trace to its origin. WE took over! The names Gai Pad Med or Gai Pad Med Ma Muang are the abbreviated versions of the full Thai name for this dish, “Gai Pad Med Ma Muang Him Ma Paan” (ไก่ผัดเม็ดมะม่วงหิมพานต์) or another way of spelling with the same pronunciation “Gai Pad Med Mamuang Himmapan”! (Gai=chicken, Pad=stir fry, Med Ma Muang Him Ma Paan=cashew nut) Please, leave the name alone out of respect. Remember that there is a Hawaiian fish named “Humuhumunukunukuapuaa” existing in this world that would make the name “Med Ma Muang Him Ma Paan” feel kinda short and pronounceable! I actually don’t like to order this dish at a restaurant, unless it is a very, very good restaurant and I know they can make this dish better than me. The reason is because I don’t like “Gai” Pad Med Ma Muang but I like “Neau” Pad Med Ma Muang more (Neau=beef). And if you ever visited Thailand, you know the questionable quality of their beef! My husband used to order a steak once in a while when we were in Thailand. He craved it, you know, just like I craved rice or noodles. My sister and I would totally pray for him to get a decent piece of beef and hope that they didn’t cook the h*** out of it. Result? Failure about 85% of the time. Thai people are not known to have good quality beef and they’ll always cook it well done even if you ordered medium rare! I would tell the waiter just to let the beef pass near the fire–don’t let it touch the grill–and I still get medium! The medium steak is the same texture as the sole of a sneaker, imagine the well done steak….That’s right, the texture of a work boot. So I never order this dish with beef in Thailand but I would make this dish with beef when I’m in the US, though. Just stir fry organic beef, nothing fancy, and you get a nice tender and juicy meat. This is not a complicated dish, but to make it exactly like the way they serve it in Thailand, you might have to do multiple steps in cooking. The first thing is the cashews. 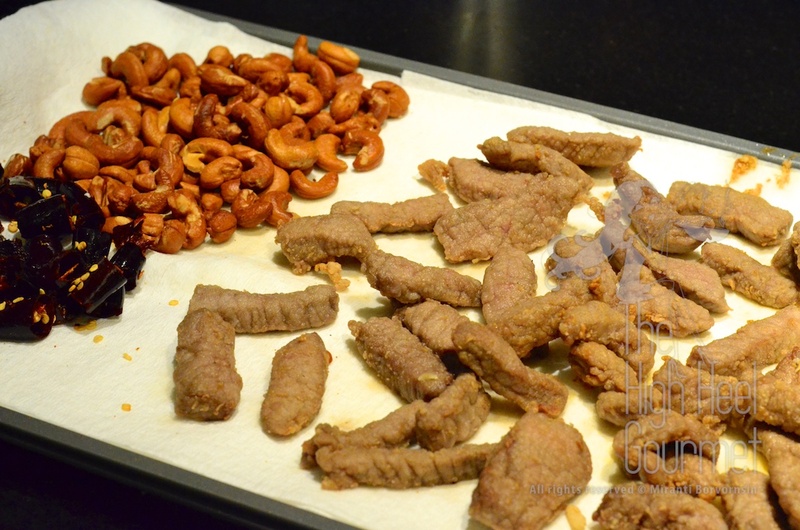 You can use already roasted cashew nuts to save one step. If you use the raw cashew nuts, you need to fry them before you stir fry them! Next is the dry chili and the meat. Both of them need to be cooked before cooking!…haha…No, don’t blame it on the Thais. This is the Chinese method. You need to fry the chiles until they turn deep red, fragrant and crispy. To cook the meat, there are two different ways. The way I like–and it is the original way–you have to fry the meat, coated with tempura or all purpose flour first. This is to make sure that the meat (chicken or beef) can absorb or hold the sauce. The flour will absorb the sauce better than the meat alone, and the added benefit is the meat will retain the juice and not leak it into the wok when cooked again. This is what makes the chicken taste so good. Tip: You don’t absolutely need to pre-fry them if you concerned about your oil intake. It won’t be as good, but it’s your choice. 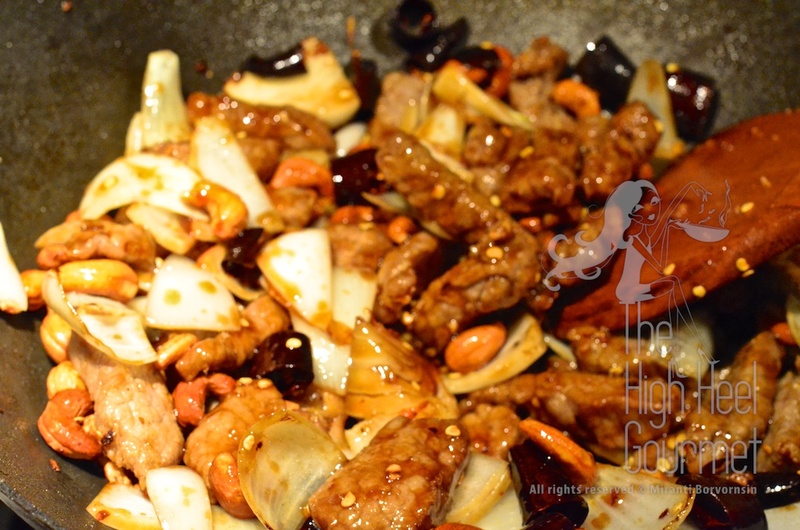 After you fry the cashews, chilies and meat, then you will stir fry them again with the sauce. 1) Mix all the sauce, oyster sauce, sweet soy sauce, light soy sauce and sugar together. 2) Add a pinch of salt and 1/2 teaspoon of white pepper to the meat, then dust them with flour, if you chose to pre-fry them. 3) Add oil to the wok and set the heat to medium high. 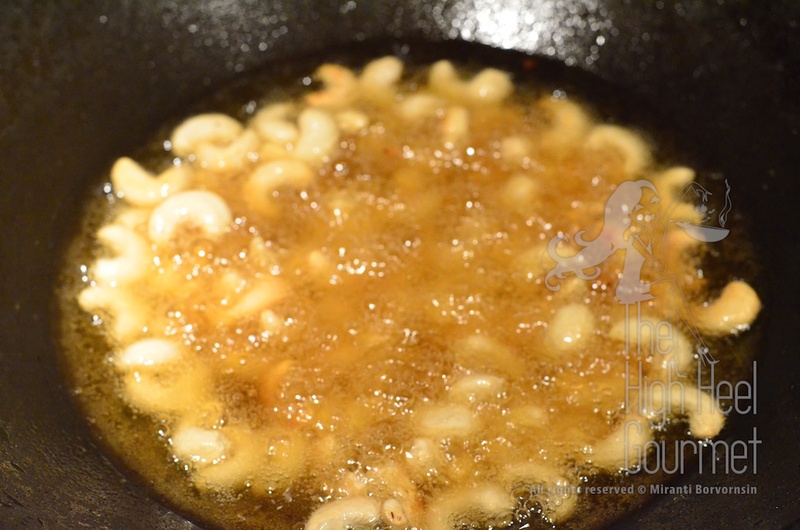 Once the oil reaches the medium high heat, add the raw cashew nuts first, then lower the heat to medium and fry them until brown. It will take a while, be patient and don’t rush it, stir often. If you use the big whole cashew (I use medium size), you can drop the heat even lower than medium. I use medium heat so the cashew nuts are cooked all the way to the inside. 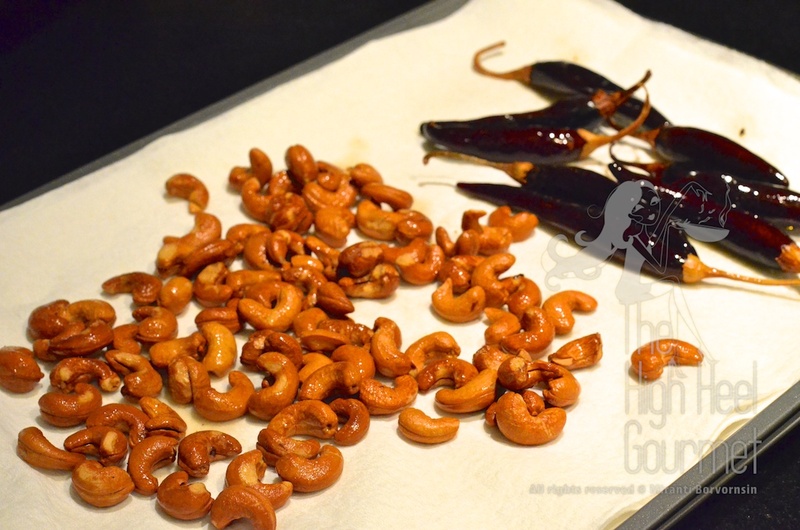 If you are using roasted cashews, you don’t need to fry them. Once the cashew nuts are golden, take them out of the wok and lay them on a paper towel to absorb the excess oil and let the nuts cool. They will be crunchy once they’ve cooled down. 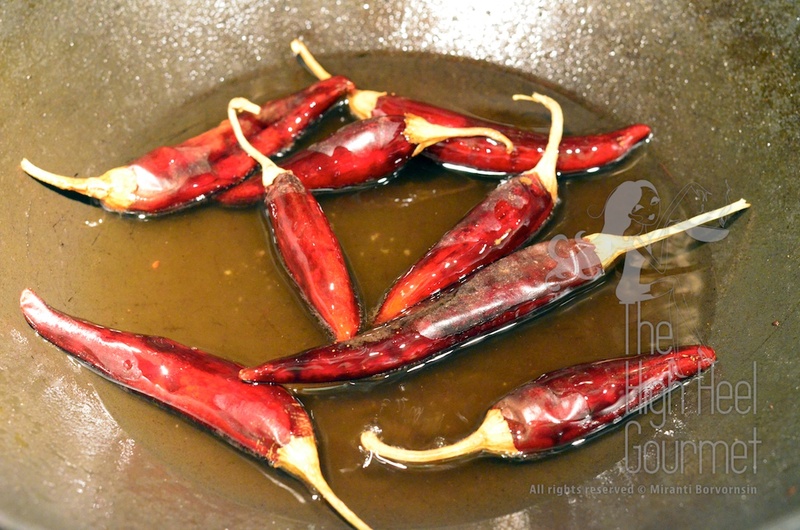 4) Next is to fry the chilies, making sure that they are all a deep red, fragrant and crunchy. Once they touch the heat, they will expand to full round pods, keep the heat at medium or lower and be very careful, the chili pod can burst. I like Puya chilies the most for this, but you can try Thai chilies if you want it spicier. Take them out and put them on a paper towel to drain some oil out and cool them down. If the chili pods are too big, once they cooled down, you will need to cut them. Also remove some seeds if you don’t want extra spicy. 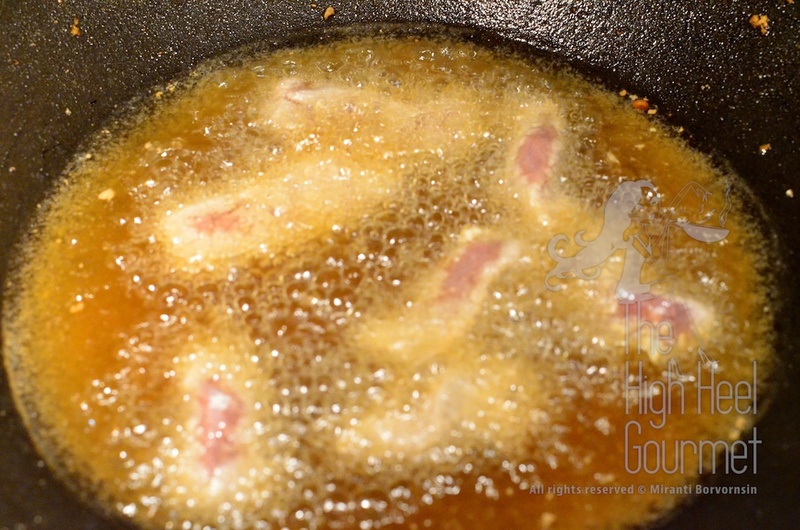 5) Increase the heat up to high and fry the floured meat. Fry quickly, only until the flour is golden on the outside. You don’t need to cook them through at this stage. 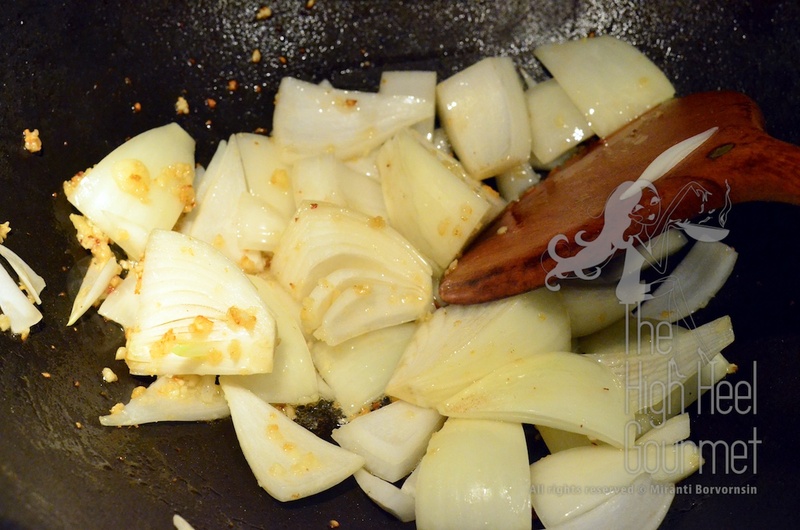 6) Take oil out of the wok, leaving only 2 tablespoons. Add chopped garlic and toss it around the pan for 30 seconds with the heat still on high. 7) Then add the cut onions. This is my favorite part of the dish. Yes, you heard right. I LOVE the sweetness of the cooked onion. How much you should cook them? Until they are slightly translucent but not soft. Think of the texture of the onion inside onion rings (I would say Fleming’s onion rings are the best example). This will take only a minute or two. 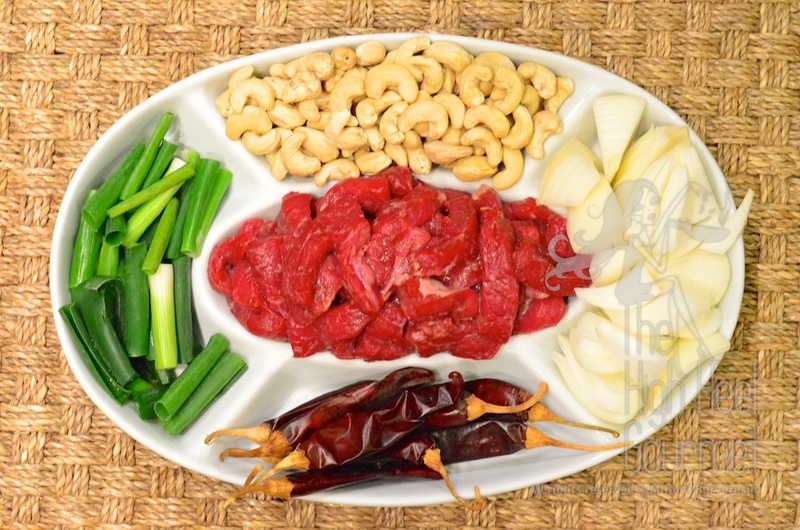 8) Add the fried meat, fried chilies and fried cashew nuts to the wok. Pour the mixed sauce over them and stir fry until the sauce coats all of the meat. With chicken, continue to stir fry until the meat is cooked through, but with beef you can stop as soon as you see the sauce coats the meat all over. 9) Turn off the heat. Add green onions and fold them in a few times. The left over heat will take care of cooking them further. Drizzle with some sesame oil and shake the white pepper on top. Serve with jasmine rice or, in the case of my husband, just a fork. This entry was posted in Beef Bison Buffalo, Chicken, Chinese, Clicking in the Kitchen, Comfort Food, Dinner, Gluten Free, Lunch, Stir fry, Thai, Vegan, Vegetarian and tagged Asian, Chicken, Chinese food, Cooking, Food, gluten free, Recipe, Rice, Sauce, Stir fry, Thai food, Vegan, Vegetarian. Bookmark the permalink. เม็ดมะม่วงหิมพานต์ (Med Mamaung Himmapan) is cashew nut. 1) You should read the package when you buy. I don’t know. It‘s depending on breed of the chicken and how it cuts. 2) Yes, they are edible. The seeds are not the part that contain the most capsaicin, the white membranes inside are. You want to keep them or not are up to you. 3) Yes. Make some extra sauce just in case you need to add them to adjust the taste. Always depend on how much can you eat? This portion should be enough for two if you serve with rice. Without rice this is good enough as one serving for a big man. This was DELICIOUS! Our family was sick of eating the same old, same old and wanted to freshen up our taste buds! I’ve had your website bookmarked for over a year and tonight I fixed the Gai Pad Med Ma Muang which was my first attempt at any of your recipes. Oh. My God. It was delicious! (I went a little overboard on the chili peppers though….). 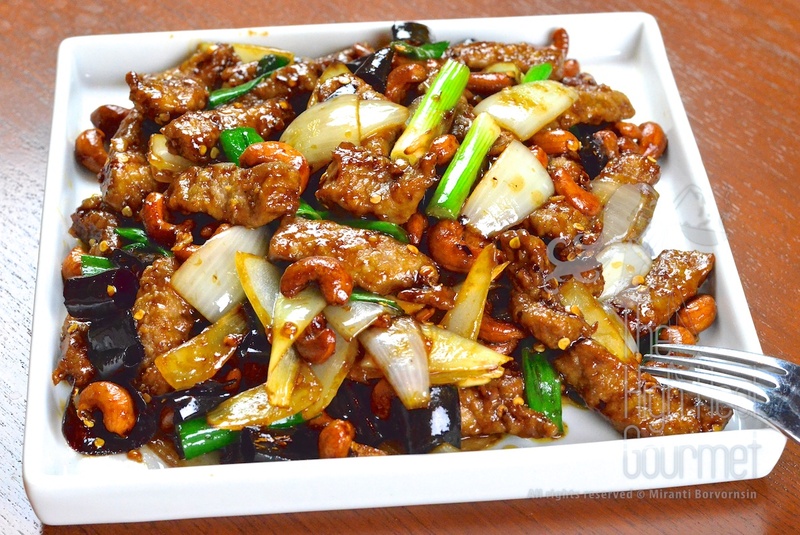 I’ve fixed stir fried cashew chicken many times, but it was never as good as your recipe. sorry to bring up a ancient thread but have just back from thailand and really hope i can make this taste like it did out there. I am Based in UK, is sweet soya sauce the equivalent of dark soy sauce as in the image thats what is on front of one of the containers? and any particular sugar you use? Actually you can use any dark soy sauce. The one I was using was the right bottle in the picture that has 3 bottles. But I change the brand of the sauce after I’m done with the bottle. Sugar type I used organic granulated but brown sugar would be ok too. We had a wonderful Thai restaurant in my town with the best chicken cashew with rich dark sauce like yours. Now all their dishes come with a pinkish sauce that seems to be doctored with a little fish sauce or a little coconut milk but every sauce is basically the same no matter what you order. I was so sad to lose my chicken cashew and am thankful you posted this great recipe. Do you have a recipe for evil jungle prince? I’ve tried a few from the internet but they aren’t right. What is “evil jungle prince”? Do you have a picture? Their menu describes it as chicken with green beans and bamboo in a hot spicy coconut sauce. Is this enough info? If not I will try to send a picture when my son comes over and shows me how. My computer skills are sad. Black soy sauce with sugar would do. I just made it with shrimp last night! As a vegetarian in Thailand I regularly order this as “Hat Pad Met Mamuang” (“Hat” = Mushroom). This dish comes in so many slightly different variations that I just want to order it at each and every restaurant (though frequently I get disappointed by a poorly done “Had Pad Nam Man Hoi“ with cashews on top). My favorite variety that I have encountered so far was very similar to your version. With crispy crumbed “Hat Fang”. I could swear that in many variations I taste something fruity (tomato/ketchup) or even a more complex combination of flavors that I can’t fully nail down yet, presumably “Nam Prig Pao” (a Thai chili/shrimp paste). Do you have any thoughts on this? Now back to the fruity flavors, I’m not sure what it is. For vegetarian we will not use oyster sauce but we will be using mushroom soy sauce instead. Thats it. Sometime we might put pineapple in the stir fry but you will see it. As for the phonetic transcription, I chose the one based on http://www.thai2english.com/dictionary/1449647.html where they use “hèt” for “เห็ด”. I think it does not matter, all ways of expressing Thai words with the English alphabet are flawed in one way or another and useful only with a lot of accompanying context information. It’s a good thing that you always write each word in Thai script as well (and I should have done the same). Being able to read Thai script is the only sane way of reading Thai words and being sure about their pronunciation and therefore actual meaning. Is your husband 50 stone? It’s not stir fried anything. Deep fried crap, poorly described and a wast of time. No, he is fit and and in a good shape, never weigh over 195lb. He knows how to balance his diet and have a good self discipline that you obviously do not have. Just for your knowledge (so you don’t bark on the wrong tree in the future), a one serving of stir-fry food uses less oil than a regular serving of salad with regular salad dressing, (approximately about 1-2 tablespoons of oil for stir-fry compare to 2-3 tablespoons of oil for one serving of any salad dressing). One serving of Thai street fried chicken, one breast and one drumstick will sum up to about 320 calories but a bacon cheeseburger with 4oz. patty packed with 600 calories, a regular cheeseburger also contained 450 calories. I assumed that you have never been to Thailand. Just to shade some light into your dark corner, There are much less over weight Thais compare to the Americans. If you are not happy in your world for whatever reason Mr.Rob Nobody, I recommend you to go get a consultation with a therapist instead of going around barf your uneducated and rude comment (even with typo) on other people blog. It “wast” your and my time both. I wish you a better and happier life in the future. I love this recipe. It has become a regular meal in my house and many guests have asked for the recipe. Thanks for sharing! 2019 and we are still making and loving it! Hello! First, I would like to thank you for all the amazing recipes, and most of all for the valuable information you make available here in your blog, about Thai culture, food, history…This is the ultimate resource for me, and I trust you like no one else that I have come across online. That being said, I have a question about this recipe: If I am to use chicken, can I/should I still dust it with flour before frying? Thank you again. Will be looking foward to hear back from you. You can do it both ways. Flour will trap more sauce than the flourless one but also have more calories from oil and many more steps to prepare. Originally in Thailand, they serve the version with flour but I do them without at home, if I use chicken. Thank you very much! I was wondering how make that extra floating sauce restaurants have when you order gai pad mamuang? Can I just double the sauce ingredients? Each restaurant has their own amount. In Thailand they don’t like to have a lot of sauce. You can double the amount and add to the pan as much or as little as you like. 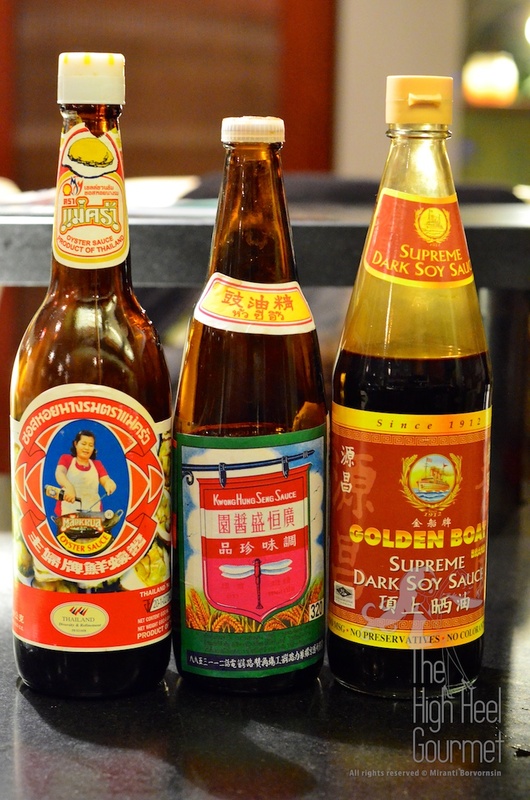 Question about soy sauces: I’m Chinese, and I have Chinese soy sauce (light and dark) on hand right now, which I understand are a bit different than the Thai versions. Would they be alright to use instead of Thai soy sauces? Of course they are. I would like to say, use whatever you are familiar with but don’t put them all in the pan. You should taste them before adding more. There are two Massaman curry recipes here on my blog. Go back to home page and browse through all the recipes, you will see them. I also have recipe for the Massaman curry paste too. This looks awesome and i wish to make it for the dinner party this week but we dont get oyster or mushroom sauce here in a small city (Amritsar) in india. Please tell me if there’s any substitute for these sauces. You can use fish sauce or just simply substitute with soy sauce. It’s just to add flavor, oyster sauce=ocean flavor. It’s ok to omit it. I made it today and it was so delicious. 🙂 You made it! It’s all you. I’m glad. It’s turn out good. I have made this about half a dozen times; it’s one of my favourite Thai restaurant dishes, so I’m really happy that you posted it! The flavour of your recipe is excellent, and it’s so easy to make. Thank you!! Im 13 Years old and i made this for my family and they loved it! Wow…that’s very impressive. Keep cooking may be you will be the next iron chef! I’m impressed. This is not a one step recipe. You did great! Looks awesome, I will try it tonite. Thanks for your time in posting this! This looks absolutely amazing. I love thai food, but only have one problem: it contains a lot of sugar. My boyfriend is allergic to sucrose (fructose is fine) and I have learned creative ways to get around this, but hesitate to do so with this dish. Can you suggest a way to make this dish sucrose free without compromising on the flavor? I already have sugar free soy sauce. So, isn’t that mean he allergic to Glucose? Sucrose or common sugar is a disaccharide that contain glucose and fructose. I’m glad you and your family enjoy it. Look at the newest recipe, the chicken with gravy over rice. If they like this they might like that one too. That is another simpler recipe. Do thai stir fry sauces or marinades use rice wine ? Or is it that more chinese? They also use the rice liquor to marinade the meat too. This dish can be marinade in rice wine or rice whiskey but I didn’t use it. This was great, I didn’t flour the chicken and I left the chillies out as my son doesn’t like the spice. Added a blob of ketchup as I didn’t have any sweet soy, but the result was fantastic. I had a happy diners at the table. For the sweet soy sauce, if you can’t find it, dark soy sauce mix with molasses would be a good substitute. Wow…ketchup! If you want to serve that to the Thais, you might want yo tell them about the ketchup first hand. 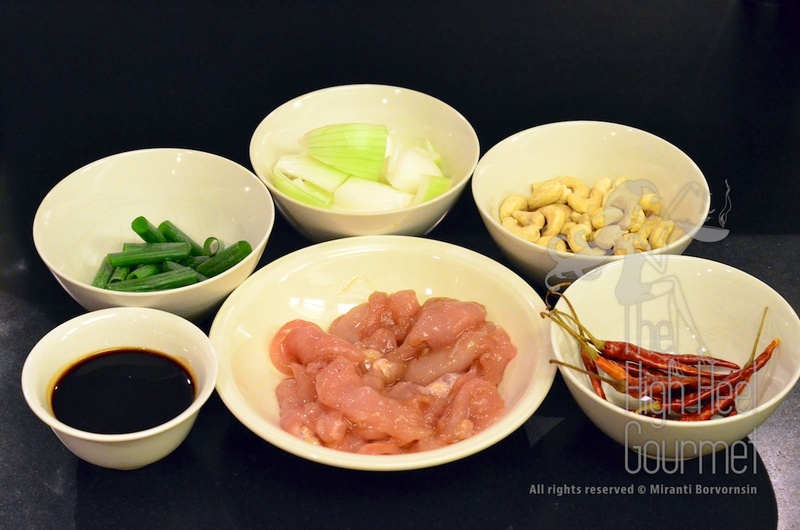 It’s probably tasted more Iike a sweet and sour dish than chicken with cashew nuts to the Thais (https://highheelgourmet.com/2014/05/03/thai-sweet-and-sour-stir-fry-pad-priew-wan/). We don’t use that many dishes with ketchup. I have tried this recipe, and it is SOOO delicious, how much chicken do you use for this recipe, because I think I put to much chicken in my dish, and didn’t have that much sauce? One cup after cutting them up in pieces. I would say 5-6oz., may be. Question about the chilies. Why dried instead of fresh? What is it adding to the flavor profile? Just curious of leaving them out in place of fresh bird’s eye for heat would change the intended flavor too much. Wonderful recipe! Ill be making it again and doing a write up of your recipe on my blog for sure. I’ll be sure to let you know when I do! We do have the other dish made with fresh chili but that dish didn’t have the cashew nuts. It called “Pad Phrik” with almost the same ingredient except the cashew, sesame oil and no need to flash fry the meat before stir-fry. This dish is originally served in Chinese restaurant and Chinese people there don’t eat chili as much as the Thais. It still considering a “Chinese” dish in the country though. This dish looks delicious, happy Chinese new year! One of my favourite dishes…have to try it!! Oh wow! I know I would just love this! Thank you so much for posting my request, my boyfriend and I will try it out soon! Oh my! This dish looks absolutely delicious and mouth-watering!!! Oh, man… That looks wonderfully delicious and wonderfully easy to make, especially if you don’t have to fry the cashews. Never saw them being fried before! And since I have never been to any other Asiatic country except Japan, what’s wrong with the beef there? Tough, tasteless, stink…would be my summary! They’re not pampering the cow as much as the Japanese or the American. As always, this looks delicious. But this time, the recipe looks simple enough that even I might be able to get it right! Haha… Might make this in the next couple of weeks! Mm… my mouth is watering thinking about it! Beautiful post. This is close to another that I plan to do in my ‘Easy Oriental’ series. Kung Pao is an old favourite of mine. lol…keep him away, before my dog bark at him…lol. She’s guarding all the foods for the photo shoot, you know. I will definitely try it soon. Does it matter whether to use flour or corn/tapioca starch as in other stir fries?? ํYou mean to coat the meat before deep fry? or to mix it in with the sauce while stir fry? I never use the starch to coat the meat for deep fry so I don’t know the result but the process is just to seal the juice in the meat and also make the sauce coat the meat easier. So, I think which flour shouldn’t be that big of a deal. This is just an opinion without testimonial. I have to do it at least once to be able to answer that question properly. In the sauce, we don’t put any flour to thicken anything because there shouldn’t be any juice in the wok. High heat, meat sealed in flour can’t leak juice, all sauce would be trapped by the flour coating to the meat. UNLESS, you don’t deep fry the meat before stir fry but I don’t think there will be that much juice anyway. So no starch in the gravy would be my verdict. How do you coat the meat with the flour? We tried and it just ended up in clumps! How do you stop it falling off? I used to live in Thailand so I know what the end result should be, but I’ve never made tempura or similar before! The easiest way is to season the meat pieces then put them in the plastic bag with flour and shake the bag. 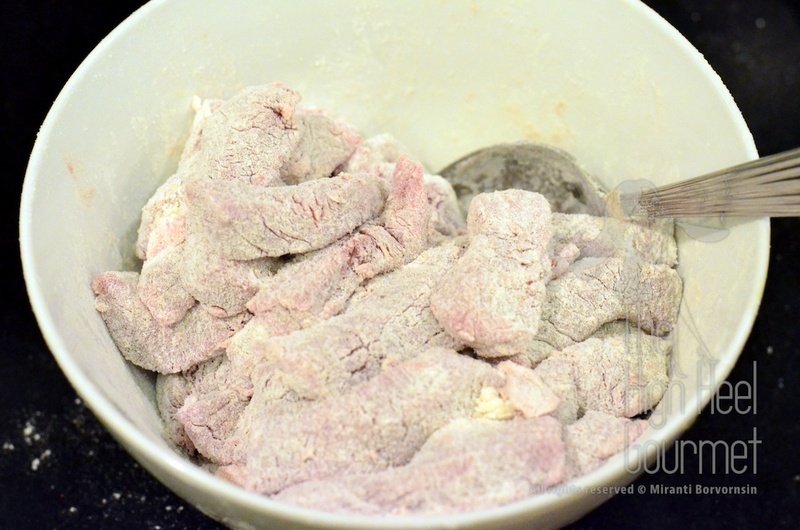 If the meat haven’t come out looking like the meat pieces the picture yet, add more flour and shake again. This way you won’t get the clump.